Imagine Cup is not just about a bunch of technology geek students gather together and compete their programming skill. Imagine Cup encourage students dare to dream about the future world where technology help to create a better world. It doesn’t matter which field are you from, as long as you are a student and dare to dream, then Imagine Cup is something where you can show the world how we should shape the future of our world. Meet team TECH4Life from Universiti Sains Malaysia, Malaysia. The team consist of Wong Poh Lee, Lee Heng Wei, Wu Kuan Herng and Chim Jeng Yang. They are the first team from Malaysia that consist of students from different kind of major. They have make all the way to the top 6 final in Envisioning 2020 Award, Imagine Cup 2010 at Poland. The Envisioning 2020 Award challenged students to express their vision for how technology will transform our lives by the year 2020. What is their envision all about? A: Most of us are still studying. Our first member is graduating this year. He is graduating in Masters in Housing, Building and Planning. The second member is pursuing his part-time Masters in Management while becoming a lecturer in a college. The third member is pursuing his part-time doctorate in Computer Science and the fourth member is still pursuing this Degree in Management. Q: Did Imagine Cup change your life? A: We came from different schools. Therefore, it is a good experience to share our knowledge from different perspective, not only from the computer science side. Getting a chance to go all the way to the Worldwide Finals gives us the opportunity to see and to know the standards and level of expertise coming from competitors all over the world. This competition changes our life by giving us the motivation, to move forward and to set higher standards in achieving our goals. Besides, we could see the effort and sacrifices they have placed in to achieve their goals. A: Our team actually works very well as most of us have a specific task to achieve. This could be the reason that we are from different schools and we could focus on different sections individually before combining our ideas into one. 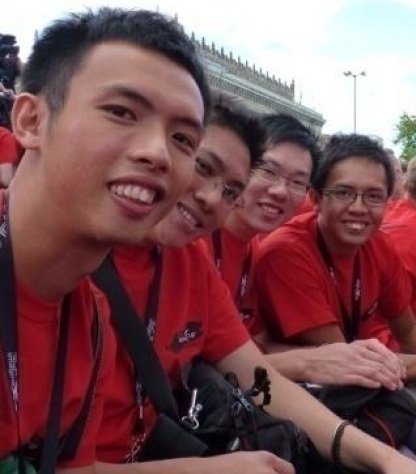 A: We could say that we enjoy every part of Imagine Cup competition. A combination of stress, fun and disappointment makes the whole competition interesting. Though our team was not announced as the winner, but we had a great time experiencing the competitor’s presentation, results presentation and great ideas from all over the world. A: Imagine Cup is like the Olympics but in the form of technologies. It is a competition for students to show their talents and great ideas which could help to shape the future. With their success, I really hope more students especially from non-computer sciences background can join Imagine Cup and create a better future together.